The all-new 2019 Hyundai Veloster is here, and there’s good news: it’s still a total weirdo. And that’s partly because the new hatchback is a lot like the lovable outgoing one. Let’s get straight to the specs. The most powerful Turbo trims get their propulsion from the same 1.6-liter “Gamma” turbocharged inline-four that powers the current model. It makes 201 horsepower and 195 lb-ft of torque, and can be mated to a six-speed manual or a seven-speed EcoShift dual-clutch automatic. But! Replacing an anemic 132-horsepower, 120 lb-ft four-banger on non-Turbo models is a 147-horsepower, 132 lb-ft 2.0-liter “Nu” four-cylinder bolted to a six-speed manual or a six-speed automatic. So basically, from a powertrain standpoint, the new Veloster gets a more powerful base engine, and now the engine and trans options look pretty much exactly like those of the new Elantra (except there’s no 1.4-liter Eco model). We don’t have any word on curb weight, but the outgoing model, which is dimensionally similar, comes in at around 3,000 pounds. And seeing as there’s no mention of significant weight savings in the press release, and the new car likely shares quite a few components with the new Elantra that also weighs about 3,000 pounds, it’s probably safe to say the new model isn’t far off that number. So 201 horsepower and a 3,000 pound curb weight definitely sound like a recipe for a VW GTI alternative, as does multilink suspension, which is standard on all trims (the outgoing non-turbo models came with a coupled torsion rear axle). 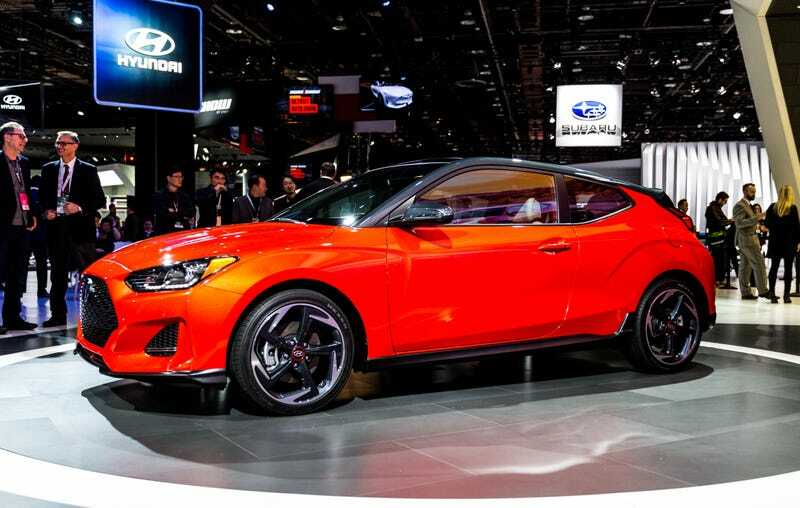 Plus, Hyundai says all Veloster models will offer Torque Vectoring Control, a system that uses ABS software to brake an inside wheel during hard cornering for improved handling. But, based on reviews I’ve read, what has held the Veloster Turbo and also the new Elantra Sport back from competing with the likes of true sports cars like the GTI and Civic Si hasn’t really been the Hyundai’s spec sheets, but rather more qualitative things like suspension, steering and transmission tuning. Hyundai says the new Veloster gets a quicker-ratio steering rack, but we’ll have to drive this thing before we pass judgement on its actually sporting potential. Still, even if the Veloster hasn’t traditionally been a track-day warrior, it’s always been quirky, with its weird, asymmetric, three-door design. For 2019, that remains, as does the swooping roofline and the squished, bug-like rear hatch. There’s also still a central exhaust in the back, plus the aggressive wheel arches and giant, wide lower front and rear fascias are classic Veloster. Even the new interior is a bit weird. Sure, there’s what looks like a standard shifter and a tablet-style infotainment screen, but just look at all the sharp creases on the door panels and dash. And check out that trim piece around the engine start button and radio controls that extends towards the driver and adds a bit of asymmetric peculiarity. Based on the photos, the interior and exterior look good. I think maybe the front end isn’t quite as wacky as the outgoing model—the lights and the gaping grille on the outgoing model were out there—but I think the Veloster keeps most of what made it such a fun car before intact. There’s no word on fuel economy figures, but based on the current Elantra and Veloster’s figures, I’d expect upper-20s in the city and mid to upper 30s on the highway. Hyundai also hasn’t released the pricing, but if the Korean automaker can combine an affordable price with good fuel economy, competent handling, and enough weirdness to make the car unique, then this could be a fun little car. The 2019 Veloster goes into production in March, and will be on sale in the second quarter of this year.